Hollandaise sauce is a delicious topping for poached eggs, fish, like salmon or arctic char, sautéed chicken, pork tenderloin, or potatoes. This Quick and Easy Hollandaise Sauce is made in the blender and comes together in minutes. Simply combine the eggs, lemon juice, tarragon, salt, and cayenne in the blender. Then slowly drizzle in the melted butter through the cap opening to emulsify. To keep warm, place the sauce in a bowl in a tray or pot of very warm water; hot water may break the emulsion. Delicious hollandaise sauce in minutes. use with eggs, fish, chicken, pork, or potatoes. Place the eggs, lemon juice, tarragon, salt, and cayenne in the base of blender or a small container for immersion blender and puree. Slowly drizzle the hot melted butter through opening in top to create an emulsion. To keep, place the sauce in a warm bowl in a tray of very warm water. Holding in hot water may break the emulsion. Before we get into the ABCs of this delicious Rosemary Honey-Mustard Sauce, I want to tell you about a product I use in place of homemade or canned stock, or, heaven forbid, bouillon. First, I want to assure you that this is not a product-sponsored post – I don’t do them. More Than Gourmet doesn’t advertise or pay anyone to promote their products; they rely on word-of-mouth. My goal is to make you aware of a superior product and I want you to know about it because it’s a key ingredient in my soup, stew, and sauce recipes. Canned or store-bought stock is thin in flavor and I don’t like the fact that salt has been added, which limits using them in reductions. Back in the day, I used to make homemade stock. It was a 24-hour chore. Starting and skimming the stock, simmering overnight, straining, cooling, and finally putting in jars for freezing. It was worth it in terms of flavor, but very time consuming. It also seemed like I used it up quickly and was back at the chore again and again and again. I have an entire pantry door devoted to a wide variety of More Than Gourmet concentrated stock and demi-glace packets. These are a life-saver, especially when I make something spur of the moment, I know I’ll always have what I need on hand. I bring this to your attention, because it’s all I use in my recipes and I believe that my recipes benefit from the depth of flavor provided by these stocks and demi-glaces, which store-bought products can’t match. Here is a quick and easy sauce that goes well with chicken and pork. It only takes about 20 minutes to make and it freezes well. Heat the oil in a small saucepan over medium heat. Slide the shallot, garlic, salt, and pepper into the hot pan, stir and sweat for 2 minutes. If the shallot begins to brown, lower the heat a smidge. Whisk in the orange zest and honey mustard. Stir in the stock or demi-glace, I used the roasted chicken demi-glace, which is more concentrated in flavor and creates a rich and tasty sauce. Toss in the rosemary sprig and simmer for 5 minutes. Discard the rosemary and pour the sauce over chicken or pork or serve in a ladled bowl on the side. Make this quick and easy sauce to use over chicken or pork. Stir in the orange zest, honey mustard to combine. Then whisk in the stock or demi-glace. The demi-glace is more concentrated in flavor and creates a very rich sauce. Discard the rosemary and pour the sauce over your chicken or pork or serve in a ladled bowl on the side. I created this Cilantro Oil to use on a Spelt Flatbread with Roasted Spiced Carrot Purée. To make an infused oil, select the type of oil you prefer, such as a mild vegetable oil, extra-virgin olive oil, nut oils, etc. Combine the oil with herbs, spices, garlic, or a any combination. This is a delicious accent for soups, stews, flatbreads, pizza, or a dipping oil for crusty breads. Use an infused oil for a creative twist on a salad dressing or vinaigrette. Drizzle over meat, chicken or fish. Lots of options! 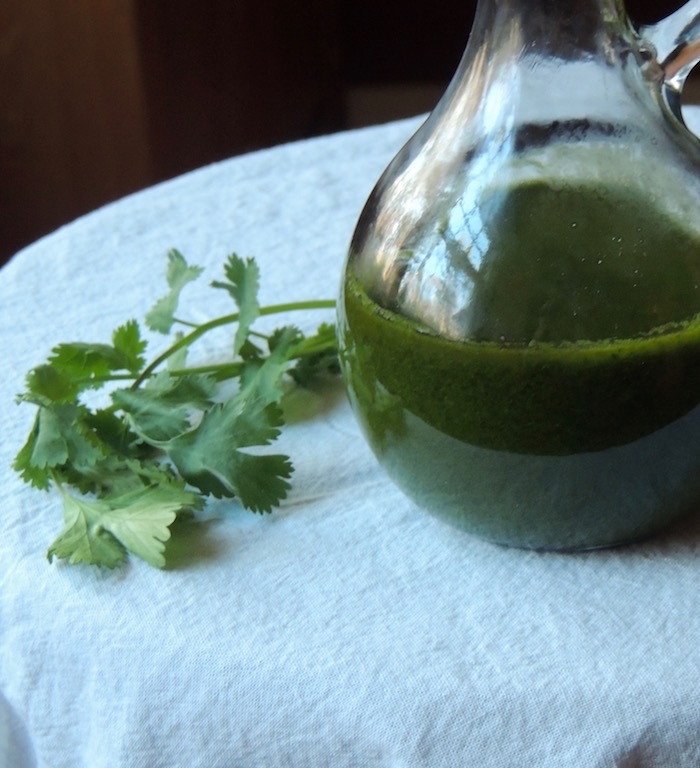 This cilantro oil is quick and easy to make. 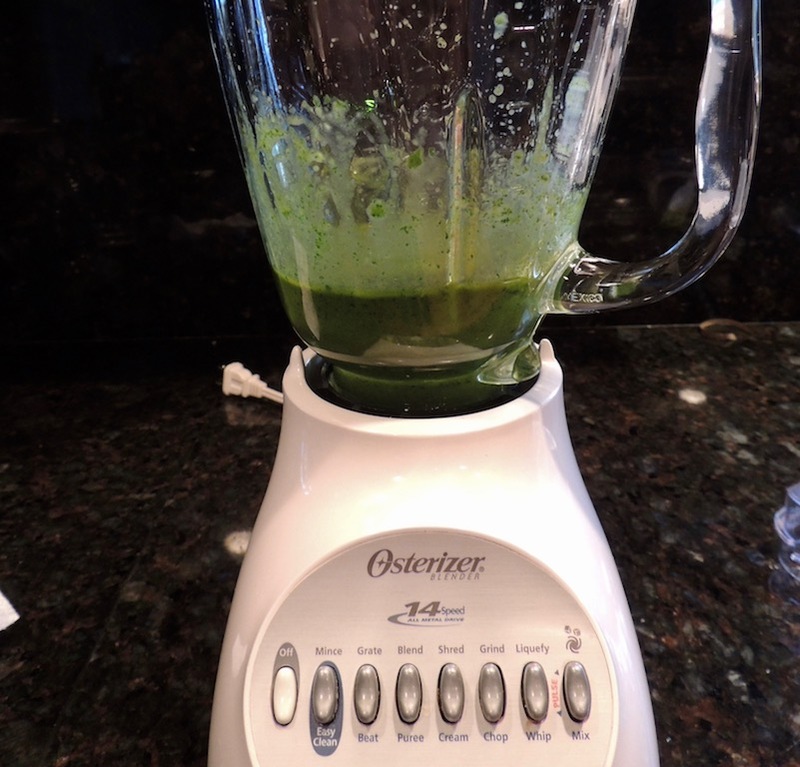 Place the oil, chopped cilantro, and salt in a blender or food processor and purée. Strain for a delicate drizzle of infused oil or leave the pulp in for a stronger flavor. Any infused oil that contains raw ingredients has a limited shelf life – 4-5 days tops, and must be refrigerated. The herbs, spices and garlic contain bacteria, commonly anaerobic bacteria, that thrive in oxygen-free environments like an infused oil. Plus a little masking tape on the jar with the date. Flavored oils are a great way to enhance a dish. Drizzle over chicken, fish, vegetables or on top of soup. Use sparingly, this cilantro oil packs lots of flavor. 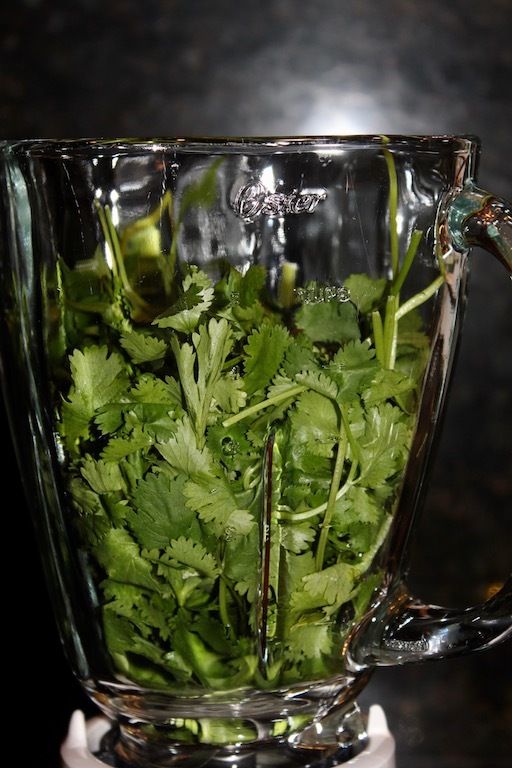 Place the oil, cilantro and salt in the base of a food processor or blender and puree thoroughly. Refrigerate up to 4 days. Strain for a refined drizzle. Keep the pulp for a stronger flavor. Marinara sauce is a quick and easy red sauce with few ingredients, minimal prep and short cooking time. It’s ready, start to finish, in an hour. Before you start, put up a large pot of salted water for pasta. This recipe makes just about one quart, which is perfect for one pound of pasta. It’s dairy-free, gluten-free and vegan. I use a little more oil to sauté the onions and garlic because a good olive oil is an essential component of a good red sauce. A medium onion minced is about one cup and 6 medium cloves garlic add a good punch of garlic without being overwhelming. I also like a little crushed pepper flakes for heat. Fresh basil adds a complementary flavor to the tomatoes. If you don’t have any, use a teaspoon of dried basil. One 28-ounce can crushed or puréed tomatoes completes the recipe. Sweat the onions on medium heat for five minutes to soften and release the natural water content. Stir in the garlic, pepper flakes and dried basil, if using, and cook for 30 seconds. Just long enough to release the aromatic aroma of the garlic. Stir in the tomatoes and fresh basil, if using, bring to a boil, lower the heat to a gentle simmer and cook for 30 minutes. The best way to dress the pasta is to put a couple of ladlefuls of sauce in the drained pasta pan and add the pasta back. Stir to combine. Serve the extra sauce and some grated Parmesan cheese on the side. See our recipe for garlic bread, a great accompaniment for a pasta with red sauce! Heat the oil in a medium, covered saucepan over high heat. Stir in the onion and cook until soft, about 4 minutes. If the onion starts to brown, lower the heat. Toss in the garlic and pepper flakes; cook and stir until fragrant, about 30 seconds. Stir in the tomatoes and basil, bring to a boil, cover and lower heat to a simmer. Cook for 30 minutes. Recipe easily doubles and freezes well. This recipe for Spaghetti and Shrimp with Spicy Pesto didn’t start out with pepper flakes. It never even occurred to me to pair pepper flakes with pesto. However, when I was sautéing the zucchini and shrimp I forgot I wasn’t making a butter sauce and sprinkled in the spice. 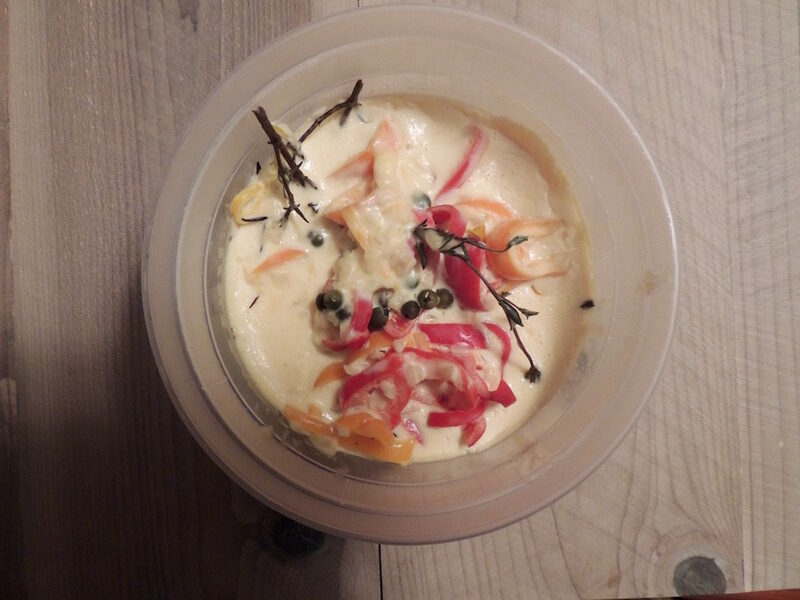 One of those “aha moments” – spicy pesto is delicious! 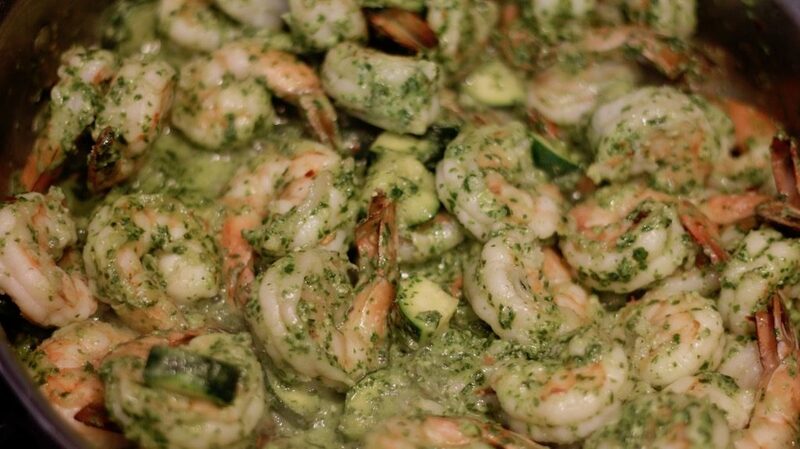 Sauté zucchini, shrimp and crushed red pepper flakes in olive; add pesto and combine, stir in cooked spaghetti and a little pasta water, if need to thin the sauce. Garnish with cherry tomatoes. Click here for the Classic Pesto recipe. Spice things up with this spaghetti and shrimp dish with spicy pesto! Cook the spaghetti according to the package instructions. Reserve ½ cup of the pasta liquid before draining. In the meantime, heat the oil in a large skillet over high heat. Stir in the zucchini and salt and cook stirring occasionally for 2-3 minutes. 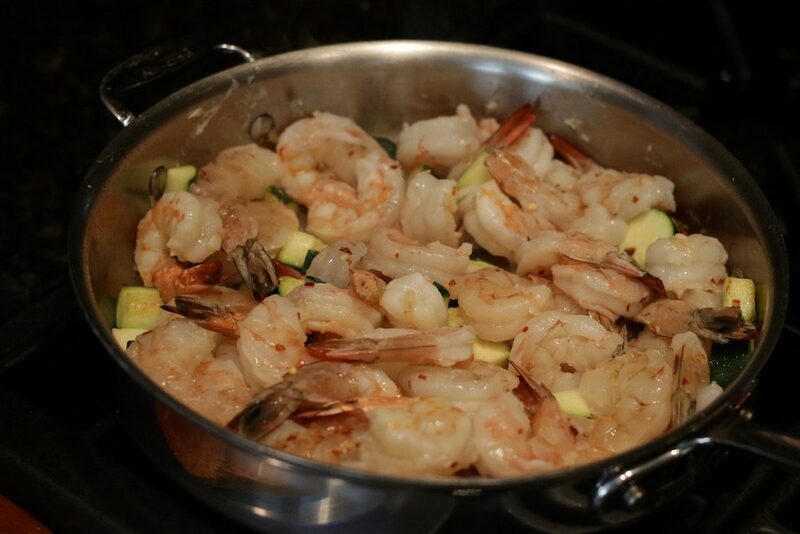 Add the shrimp and crushed pepper flakes, cook stirring occasionally until shrimp are pink and firm – about 5 minutes. Stir in the pesto sauce and ¼ cup of the reserved pasta liquid. Stir to loosen. Add the pasta, stir to combine and add as much pasta liquid as need to coat the spaghetti evenly. When basil is at its peak, the bunches are huge and plentiful. I scoop up tons and bring them home to make pesto; batch after batch. I freeze in one-cup portions, which is perfect for a pound of pasta. Don’t limit yourself to pasta, though, it’s delicious over grilled chicken, just put a good dollop over each cutlet. I also like to use it in a caprese salad – instead of olive oil and balsamic vinegar, little dabs of green goodness on the tomatoes and cheese is a fantastic variation. Grill some eggplant rounds and stack with mozzarella, roasted red peppers and slather a little sauce on each layer. Here’s some tips to making pesto. Young basil (thin stems) use both the stem and the leaves. Remove tough stems on mature basil. 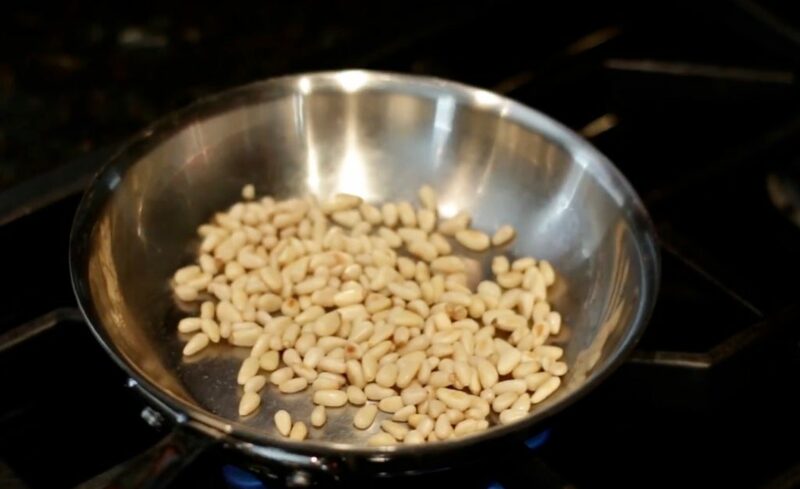 Pine nuts are the classic nut used in traditional pesto, but don’t hesitate to use walnuts or almonds. Be sure to toast your nuts to maximize flavor! Keep nuts in the refrigerator or freezer to prevent spoilage. Use the lemon juice not only for flavor, but it also prevents the pesto from turning black when mixed with hot food. See our Spaghetti with Shrimp in Spicy Pesto recipe here. Head out to the garden or the local farmer’s market and bring home the basil! Watch the Pesto Video Here. 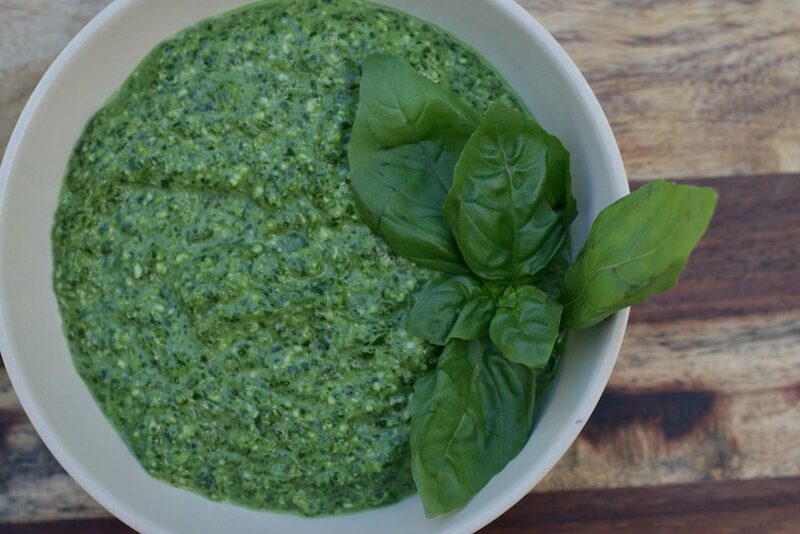 Classic pesto made from fresh basil is a multipurpose sauce. Make large batches and freeze for year-round use! Use on chicken, fish and vegetables. Place the basil, cheese, nuts, lemon juice, garlic, salt and pepper in a food processor. Pulse to chop up the ingredients. Turn the processor to “on” and slowly pour the oil through the spout until an emulsion forms. Store in an airtight container with a piece of plastic on top of the pesto to keep the oxygen out. Compound butters combine unsalted butter with different aromatics, such as herbs, shallots, acid, salt and pepper, and/or spices. Mix room temperature butter with the finely minced aromatics you think pair well with your entrée. Mix them together, place on parchment paper or plastic wrap and form into a sausage shape and refrigerate. These freeze well, too. Today’s lesson includes three very different versions, each appropriate for different kinds of protein. Top the cooked meat, fish or chicken with thin slices of the compound butter while it’s piping hot. The melting butter creates a very flavorful sauce. This is a quick and easy method of dressing up a simple dish in really delicious way. Watch the Compound Butter video here. This compound butter is delicious with chicken or fish. Cut 2 or 3 thin slice and drape across the top the hot meat to melt quickly and allow the flavors to spread over the top and sides. Keep in the refrigerator for 3-4 days and in the freezer 2 months, wrap tightly. 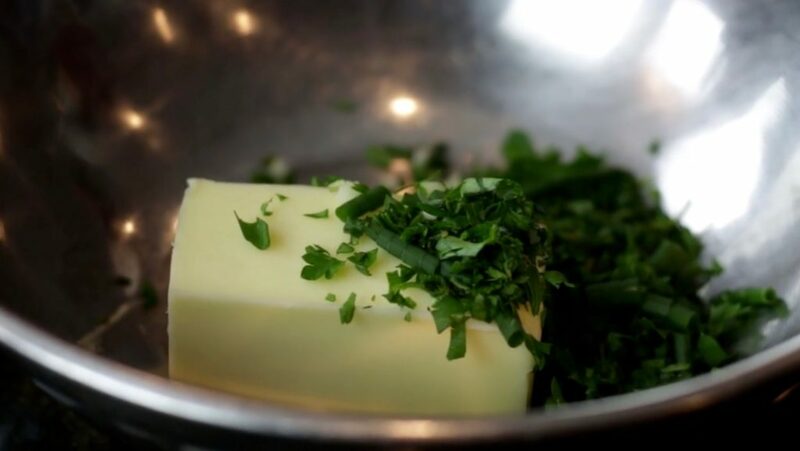 Thoroughly combine the butter, garlic, chives, parsley, thyme, lemon zest, salt and pepper in a small bowl. Lay the butter on a piece of plastic wrap about 1/3 of the way from the end. Take the bottom of the plastic wrap and lay over the butter. With a spatula or table knife, push the butter into a long tube. Wrap tightly and refrigerate. Slice into ¼-inch coins and place on top of cooked meat, fish or poultry. A perfect compound butter for fish, especially salmon! Cut 2 or 3 thin slice and drape across the top the hot meat to melt quickly and allow the flavors to spread over the top and sides. Keep in the refrigerator for 3-4 days and in the freezer 2 months, wrap tightly. Thoroughly combine the butter, dill, lemon zest, salt and pepper in a small bowl. A rich and hearty compound butter perfect for red meat. Cut 2 or 3 thin slice and drape across the top the hot meat to melt quickly and allow the flavors to spread over the top and sides. Keep in the refrigerator for 3-4 days and in the freezer 2 months, wrap tightly. Thoroughly combine the butter, blue cheese, shallot, parsley, pepper and vinegar in a small bowl. 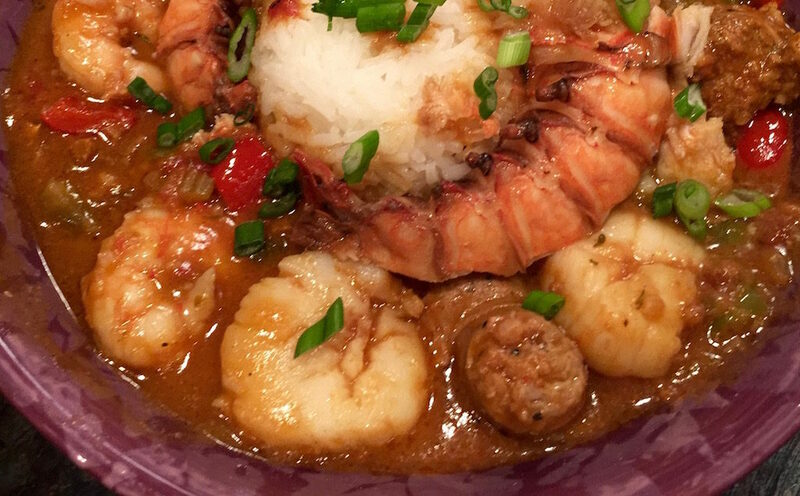 I was looking for something different to make for dinner the other night and Shellfish and Sausage Gumbo came to mind. I’d never made a gumbo before and did some research. There is a spice mix called Cajun spice mix that I was pretty sure I could find at Fairway. While I was there I picked some petite lobster tails, shrimp, scallops, and sausages. Any gumbo requires a roux. This is a thickener made of equal amounts by weight of vegetable oil or butter and flour. For this style of Louisiana cooking, a dark roux is preferred for the depth of flavor it brings to the dish. The thickening power is weakened by the long cooking time but that’s easily remedied by adding okra to the pot or sprinkling a little filé powder (dried and ground leaves of the sassafras tree) to each bowl. 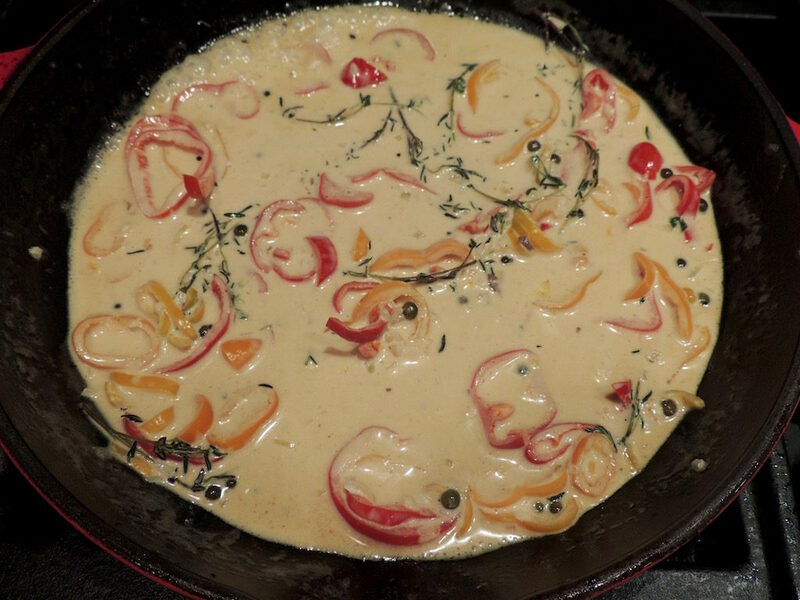 There are two ways to make a roux either on the stovetop (30-40 minutes) or in the oven (1 ½ hours). I was in no hurry that afternoon, wanted to do some other things, and opted to make the roux in the oven. The stovetop version requires a little more attention. The oven version you have to stir a couple of times, so I set the timer for 30 minutes twice and gave a quick stir each time. I diced up lots of aromatics: onions, celery, green and red bell peppers, scallions and garlic for a flavorful base with chicken stock, fire-roasted tomatoes and sausages. To easily extract the lobster tails, I cut through the underside with kitchen shears before cooking. I wanted the lobster shells in the broth to add flavor and removed them before serving. These went in first for ten minutes followed by the shrimp and scallops and cooked for another 5-6 minutes. Don’t boil or the seafood toughens. Mound some rice in a bowl and surround with the gumbo and top with a handful of sliced scallion greens. Don’t skimp on the dark roux – it adds lots of flavor that is typical of a gumbo. Use file powder to thicken the gumbo, let each individual sprinkle over his/her own bowl. Whisk the oil and flour together in a large Dutch oven or heavy-bottomed saucepan. Place in the preheated oven and cook for 1 ½ hours, stirring 3 times. Stir in the onion and salt and sweat for 10 minutes. Add the celery, peppers and scallions to the roux and continuing cooking, stirring occasionally for 5 minutes. Stir in the garlic and Cajun spice mix and cook until fragrant. Add the sausages, stock and tomatoes; bring to a boil, lower the heat and simmer for 30 minutes. The stew can be made in advance to this point. Thirty minutes before dinner, bring the gumbo back to a boil and then add the lobster tails. Simmer for 12 minutes. Add the shrimp and scallops and continue cooking on low for 5-6 minutes. Serve over rice and garnish with scallions. 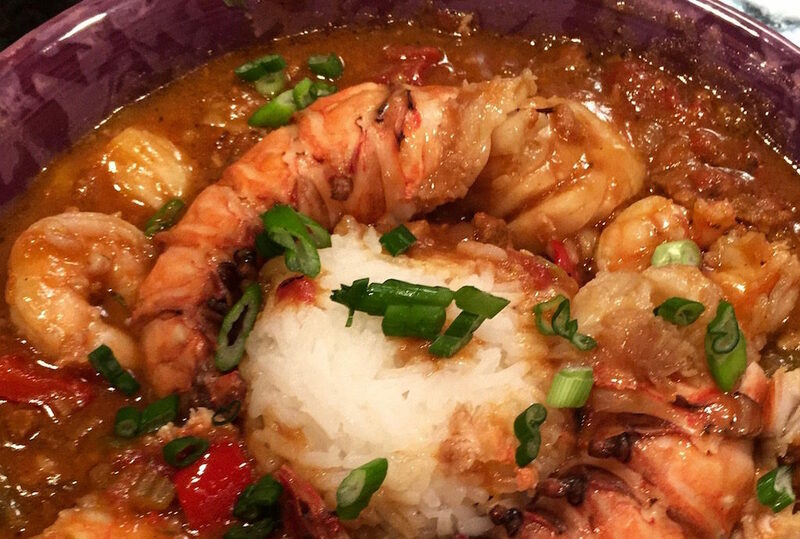 Don’t boil the gumbo after adding the shellfish; it gets very tough. ours, and one I had for the first time on our honeymoon at Euphemia Haye in Longboat Key. That was almost 35 years ago and I see the steak is still on the menu! I decided on filet mignon for the steak and spinach and roasted butternut squash as the sides. I had previously picked up a bag of mini assorted bell peppers and thought they would make an interesting twist on this recipe. I like to prep meals in advance, this makes dinner less hectic and it also means that many of the pots and pans and cooking utensils are already washed. 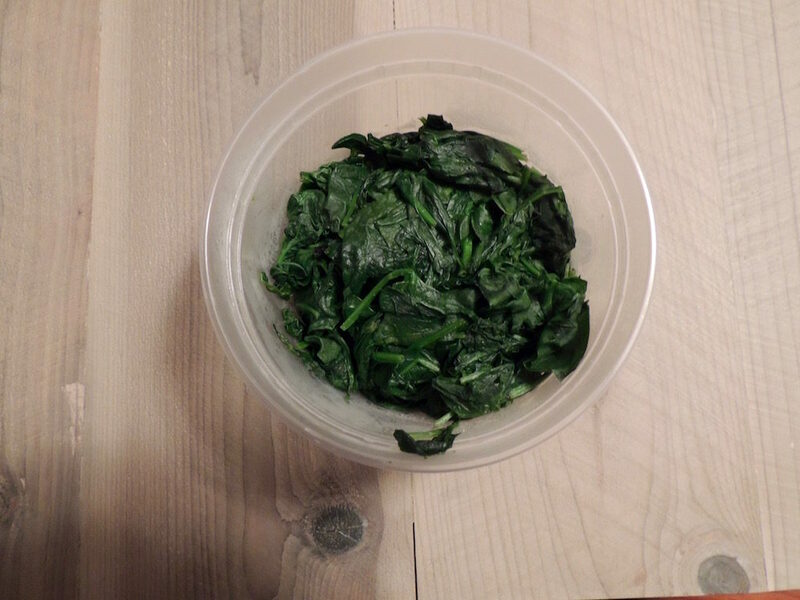 Spinach contains lots of water and I prefer to precook it to get rid of excess moisture, which thins the sauce. Place the spinach in a large saucepan with a little cold water, cover and cook over medium-high heat until wilted, about 2-3 minutes. Remove the tops of six of the mini peppers (mixing up the yellow, orange and red) and then use a vegetable parer to scoop out the seeds and ribs. Slice them into thin rings and toss them into a sauté pan with a little olive oil and unsalted butter (about 1 tablespoon each), a small minced shallot, about a tablespoon of green peppercorns, a few sprigs of fresh thyme and good covered for a few minutes. Pour in a little dry white wine (1/2 cup) and reduce bit before adding a cup of heavy cream. The sauce is ready once it comes to a rapid boil. I had purchased already cut butternut squash, which I tossed with olive oil, salt, pepper and herbes de Provence in a small baking dish. Pop the squash, spinach and sauce went into the fridge for later. Season both sides of the filets with lots of freshly ground pepper and salt and then place them in a super hot sauté pan with a little olive oil and cook two minutes each side. To finish the cooking, po the pan in a 350 degree F preheated oven for 10 minutes for medium rare. Let the filets sit on a cutting board and add 1/4 cup bourbon to the sauté pan. To soften the harshness of the alcohol, I lit the bourbon and let it burn out. Stir in the sauce (removing the thyme sprigs) and reheat. Slice the meat and spoon the peppers over the top. Stir in the spinach to the remaining sauce and reheat. Place the creamed spinach around the sliced meat and then scattered the roasted squash on top of that. This is a rich dinner, one you might consider making for a special occasion. This recipe uses brined green peppercorns, freshly ground black pepper and sliced fresh mini bell peppers for a little twist on this classic recipe. Prep this dish in advance to make clean up easy. Melt the butter with the oil in a saute pan over medium heat. Stir in the peppers, shallots, peppercorns, thyme and salt; cover and sweat for 3 minutes. Add the wine and boil for a couple of minutes. Add the cream and cook until it comes to a rapid boil. Remove to a storage container. Generously season both sides of the steaks with the salt and pepper. Heat the oil over high heat. Add the steaks when the oil is almost smoking and cook for 2 minutes per side. Pop in the oven for 10 minutes for medium rare. Remove to a cutting board to rest. Add the bourbon to the meat pan, ignite and let burn. Add the sauce, discarding the thyme sprigs, to the pan and reheat. Slice the meat, place on a warm platter and cover with the peppers from the sauce. Stir the spinach into the sauce and reheat. Place the spinach along the outside of the sliced steak. I’ve been gifted so many plum tomatoes this summer that I just finished up my third batch of fresh tomato sauce base. It’s a great way to use up a plethora of produce for future use, such as the base for a spaghetti sauce or as the tomatoes in a chili. Wash the tomatoes thoroughly and remove the cores and any soft spots or black marks. Chunk the tomatoes up, slide them into a large saucepot, cover and cook over low heat. Once the tomatoes begin to release juices, raise the heat a bit to a gentle simmer. Stir occasionally and cook for 20 minutes. In the meantime, set up a food mill over a large saucepan or bowl. Ladle the tomatoes into the food mill and puree in batches, discarding the accumulated skins as needed. Heat olive oil in the empty saucepan or stockpot over medium heat. Add the onions, garlic and salt. Basil is optional. 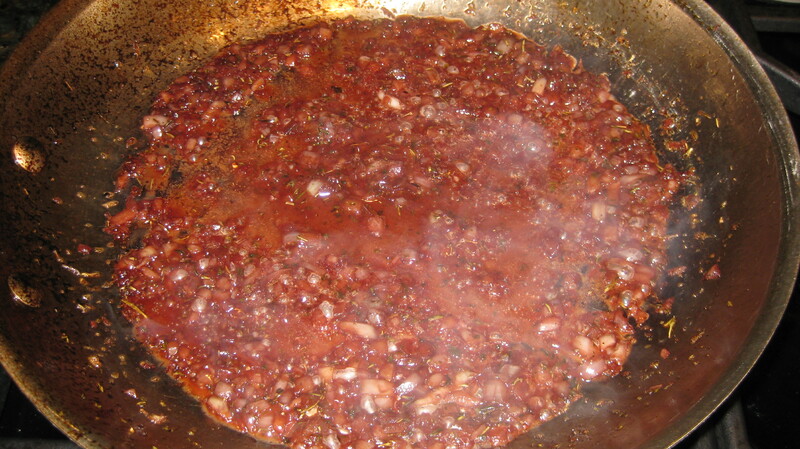 The sauce needs additional cooking time to reduce the excess water and intensify the tomato flavor. Boil gently until reduced by at least one-quarter. Fill pint-size containers with the sauce and when slightly cooled cover and refrigerate for immediate use or freeze for later. Having a fresh tomato sauce base on hand not only uses up excess produce, but provides many opportunities for a wide variety of uses. Place the tomato chunks in a 7-quart Dutch oven or large covered saucepot, cover and bring to a boil. Lower the heat to a simmer and cook for 20 minutes. 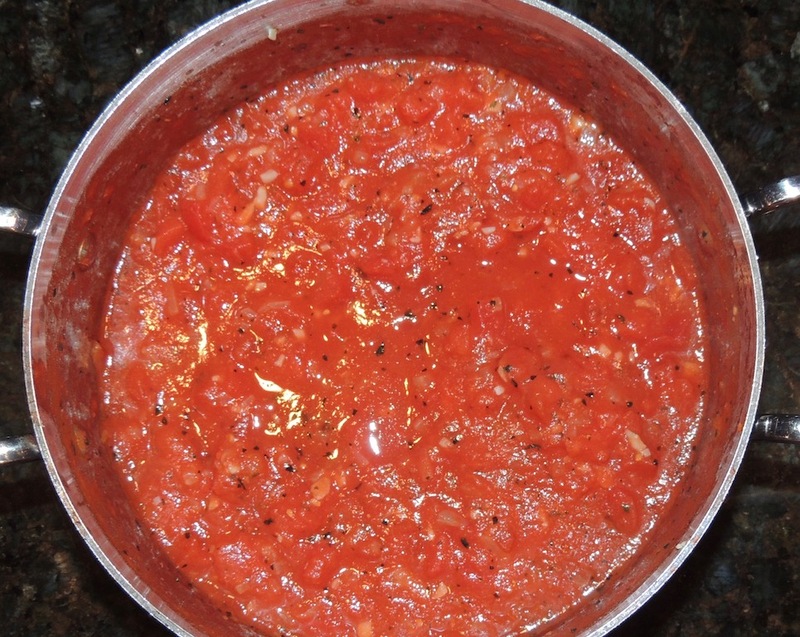 Ladle the tomatoes into a food mill placed over another large pan or bowl and puree, discarding the skins. Pour the oil into the emptied pot and place over medium heat. Stir in the onions, garlic and salt, cover and sweat for 10 minutes. Pour the pureed tomatoes back into the pot and bring to a boil, lowering the heat slightly and continue cooking at a gentle boil until the sauce has reduced by one quarter, or more if it’s still watery. Cool, ladle into Mason jars and put a couple of basil leaves in each jar, optional. Cool, cover and refrigerate overnight. 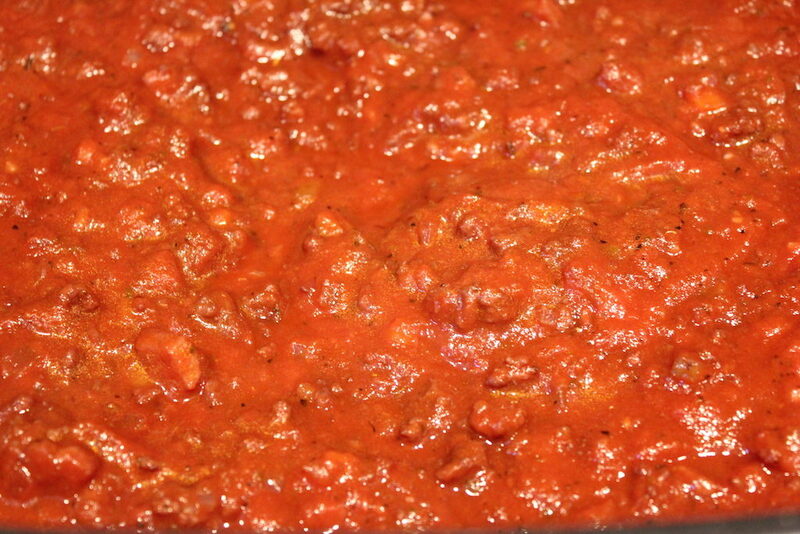 Use as a red sauce for spaghetti, in chili recipes or for soup and stews. 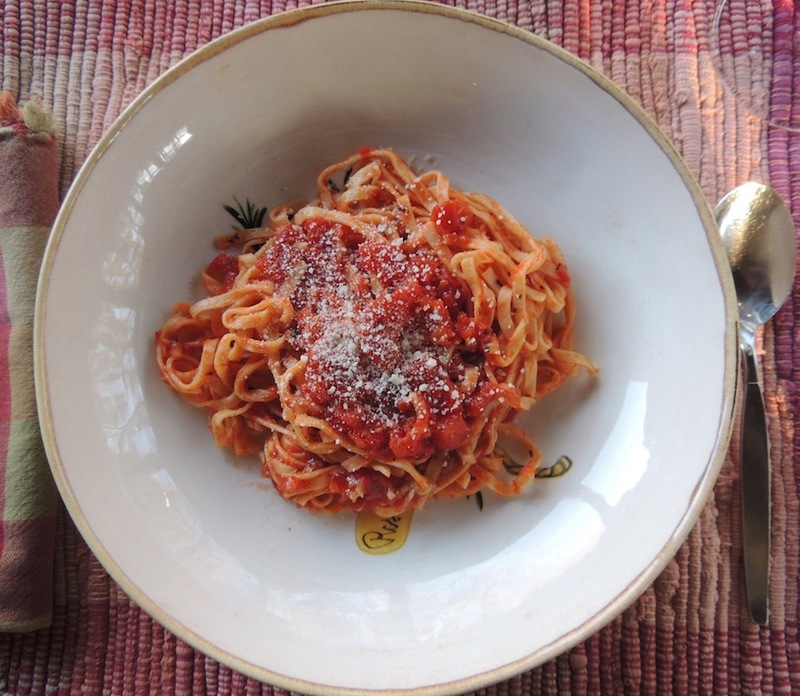 One of my favorite dinners is spaghetti and I also love a thick, meaty Bolognese Sauce. Serve with a simple green salad, warm crusty bread and a good bottle of wine and you have the makings for a simple and elegant dinner for two . 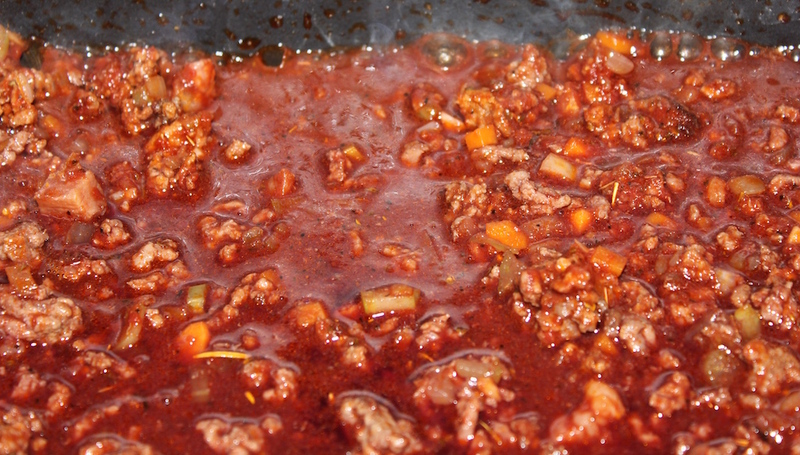 Bolognese sauce is a meat-based red sauce from Bologna that uses three techniques, sautéing, sweating and braising, to create an intensely flavored meat sauce of ground beef and a fatty pork meat, such as pancetta. The classic way to serve this is over broad noodles like pappardelle or spinach tagliatelle or as a sauce for lasagna. We’re straying a little and going with spaghetti. Make the sauce in advance; it freezes well. 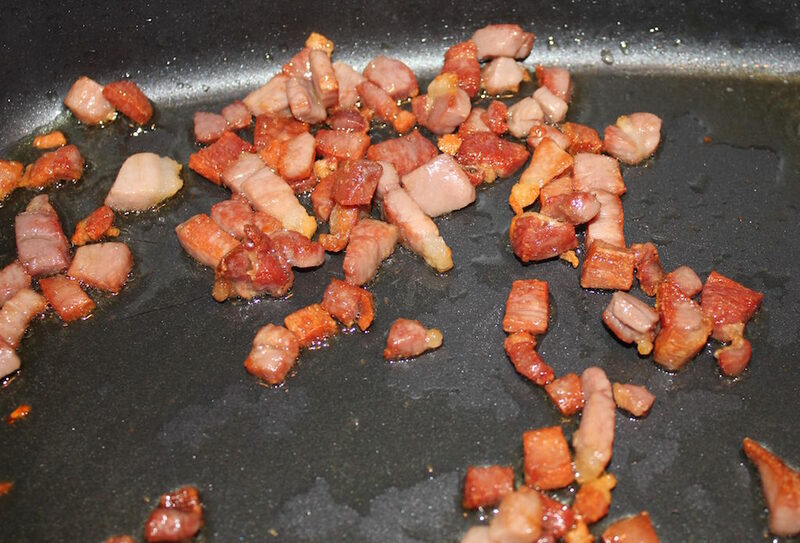 Heat the olive oil over high heat in an ovenproof slow cooker liner or a heavy-bottomed 7-quart Dutch oven, add the pancetta and cook, stirring occasionally, until golden brown. Remove to a bowl. 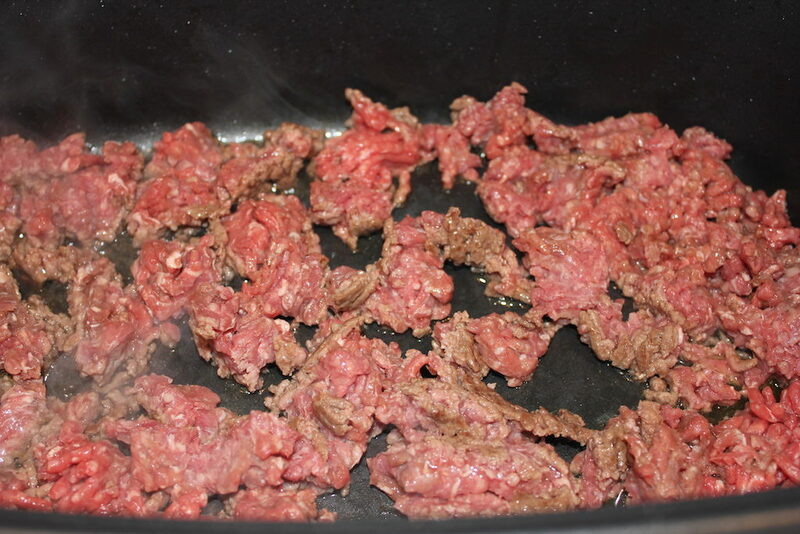 Add the beef to the hot pan, use the tip of a wooden spoon to break it up into small pieces. Brown over high heat, stirring occasionally. 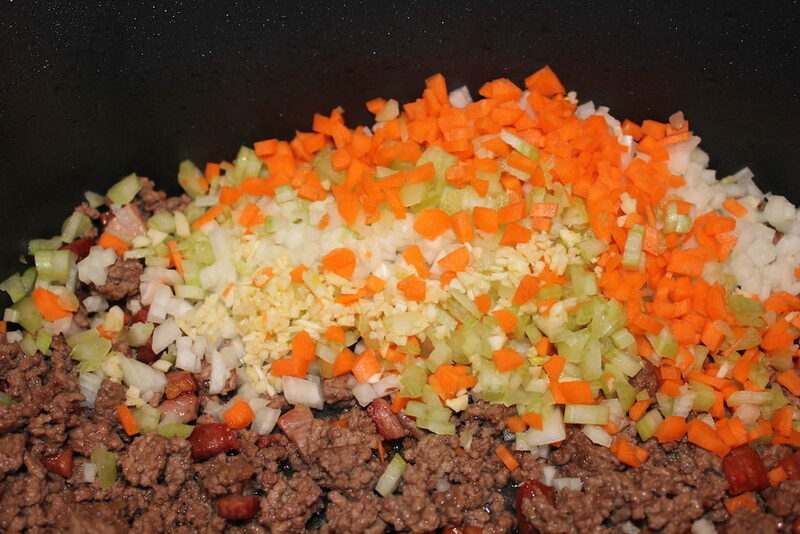 Stir in the pancetta, onion, carrot, celery and garlic, reduce the heat to low, cover and sweat for five minutes. 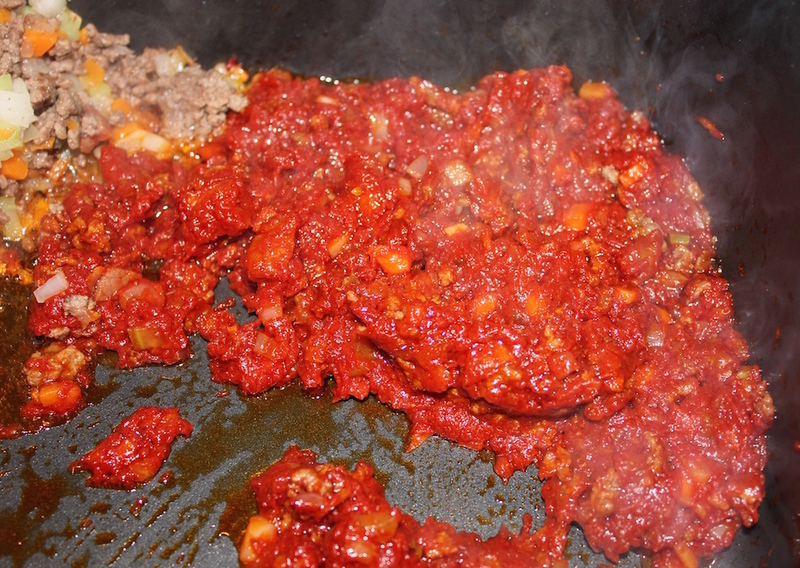 Push the meat and vegetables to one side and brown the tomato paste for three minutes, stirring frequently. Stir in the dry herbs and pepper. Add the wine, bring to a boil and reduce by one-half. Makes 1 quart, enough for one pound of pasta or a lasagna. 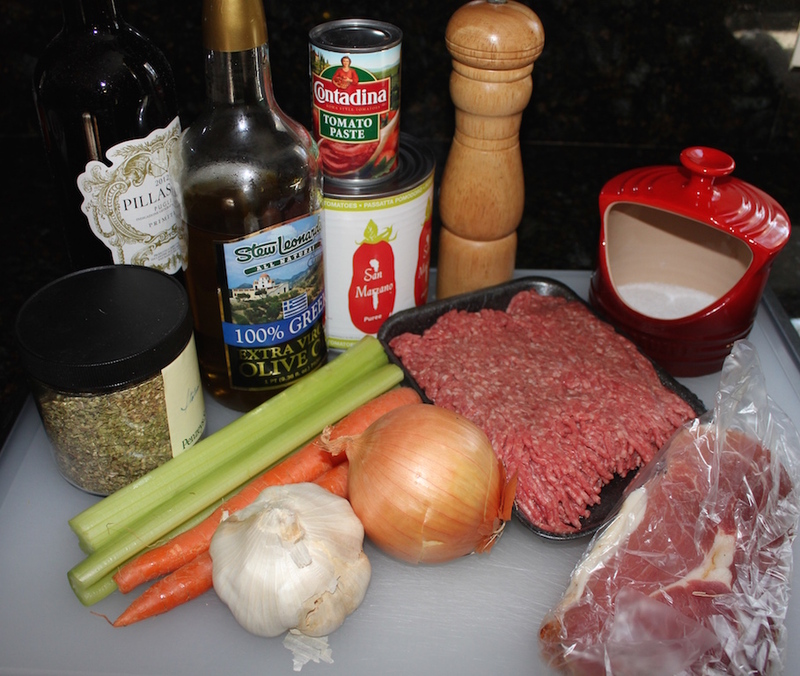 Bolognese sauce is a meat-based red sauce from Bologna that uses three techniques, sautéing, sweating and braising, to create an intensely flavored meat sauce. 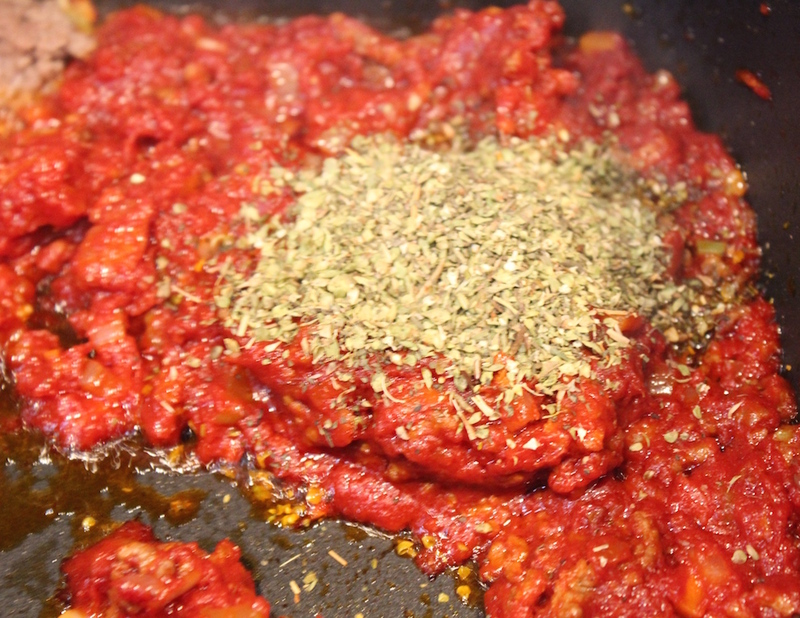 Push the meat and vegetables to one side and brown the tomato paste for 3 minutes, stirring frequently. My plans for dinner, grilled pork chops with haricots verts in garlic butter and mashed sweet potatoes with goat cheese were spoiled by the weather. It’s a dreary, snowy-rainy, rainy-snowy day. I shoveled this morning, something I usually enjoy, but the snow is heavy and I finished, an hour later soaked and cold to the bone. The snow continued and the shoveled parts were clogging up with slush again. 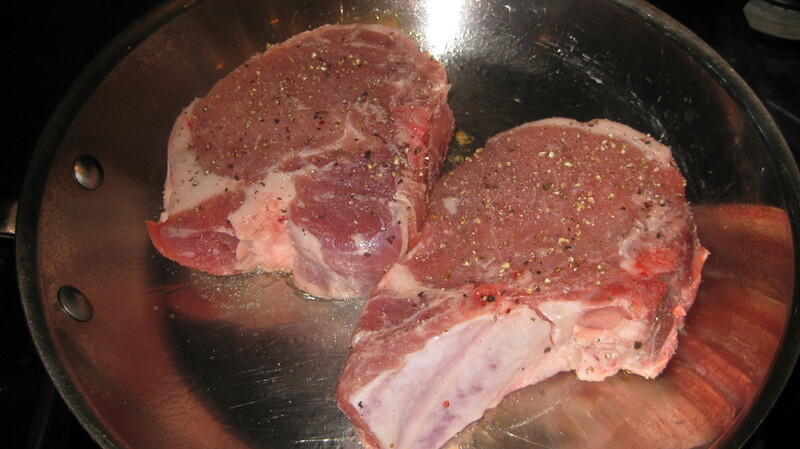 What is really bugging me are the thick pork chops for dinner that I was planning on grilling. But who wants to go out in the rain and slush to cook. Believe me, I have gone out in many a bad weather, but this one just makes you want to hunker down and avoid the cold, chilly, rain and the slippery deck. The options are to broil or pan roast the chops. The nice thing about pan roasting is you can make a quick sauce from the fond in the pan. 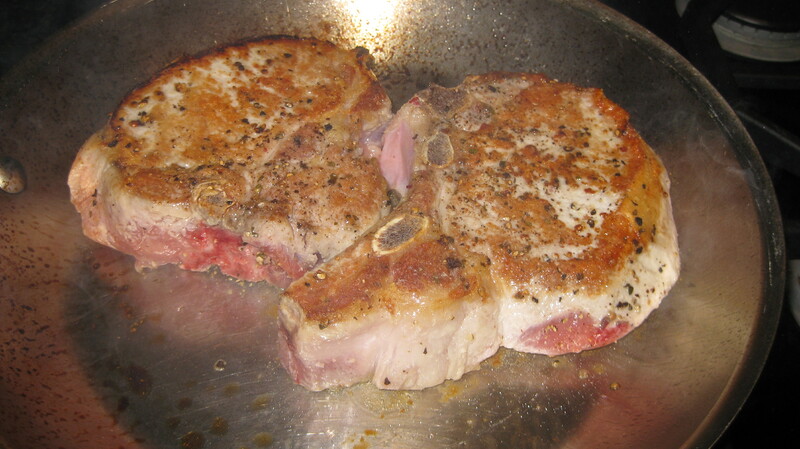 Generously season both sides of the pork chops salt and pepper. Let sit for 4 hours or overnight. Bring out the chops about 30 minutes before cooking to let them warm up a bit. This helps keep the juicy. 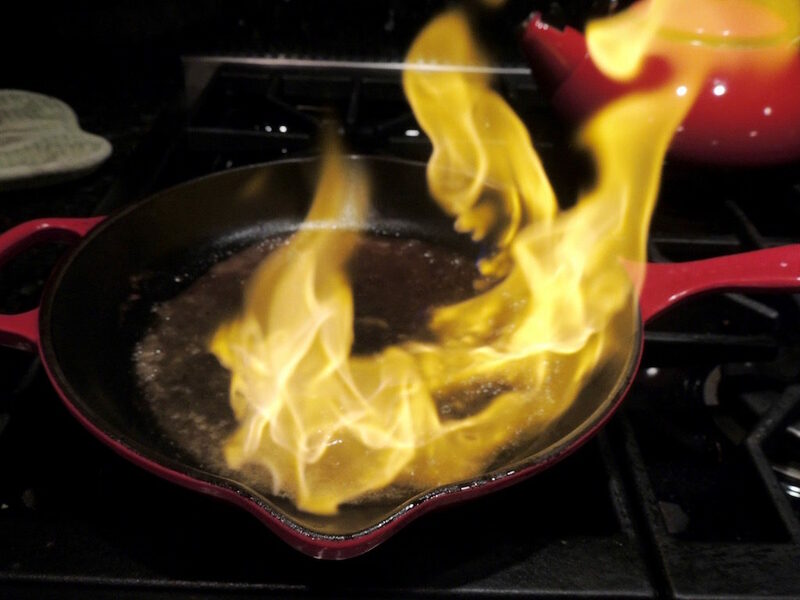 Pour oil into a large skillet with an ovenproof handle and place over high heat. 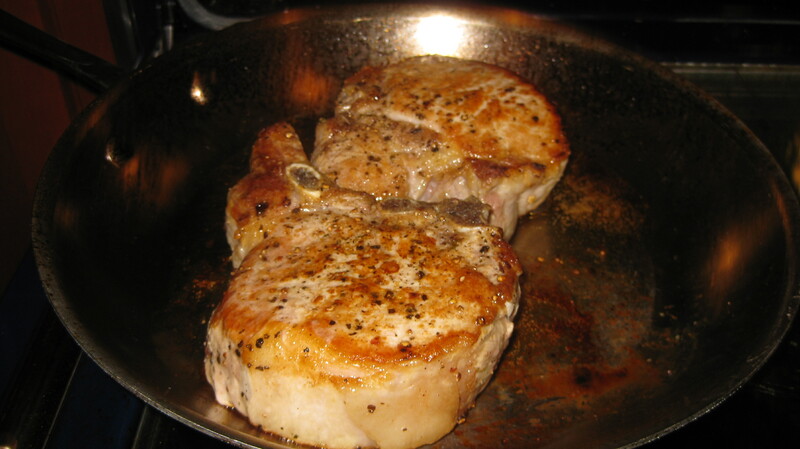 Place the chops into the hot pan and sear for about 2 minutes or when the chops are nicely caramelized. Turn and cook for another 2 minutes. Place seared chops into preheated oven and cook until internal temperature reads 145ºF for medium (the chops will be slightly pink inside) or longer if you want them well done. The timing will depend on how thick the chops are and if they came directly from the refrigerator (cold) or sat on the counter for a short time (less cold), but figure at a minimum for a thick chop about 10-12 minutes. 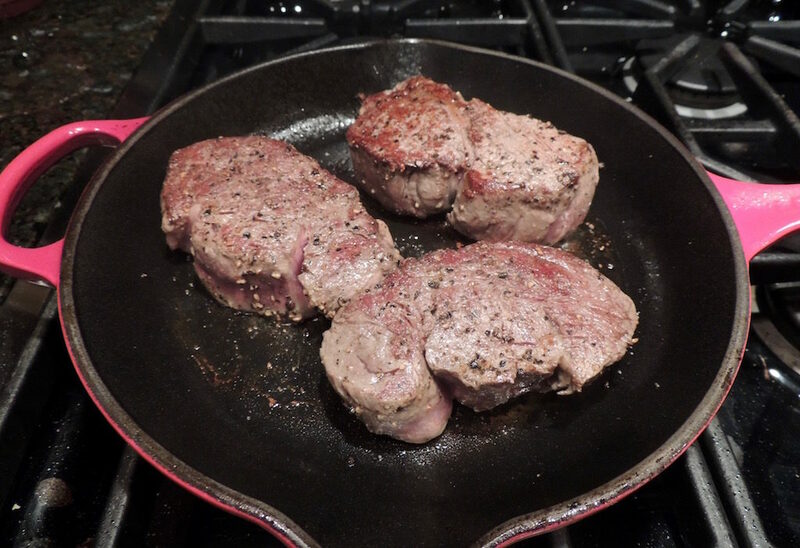 Remove chops to a warm serving plate and place hot pan over medium-high heat on the stovetop. Add the wine, shallot, and herbs to the pan, scraping the bottom of the pan to loosen the fond (browned tidbits left from the caramelized chops). Return the pan to the stovetop over medium heat and cook for 2 minutes. Add the stock, bring to a boil, lower the neat to a gentle simmer and cook for 3 minutes. Pour over the chops and serve. 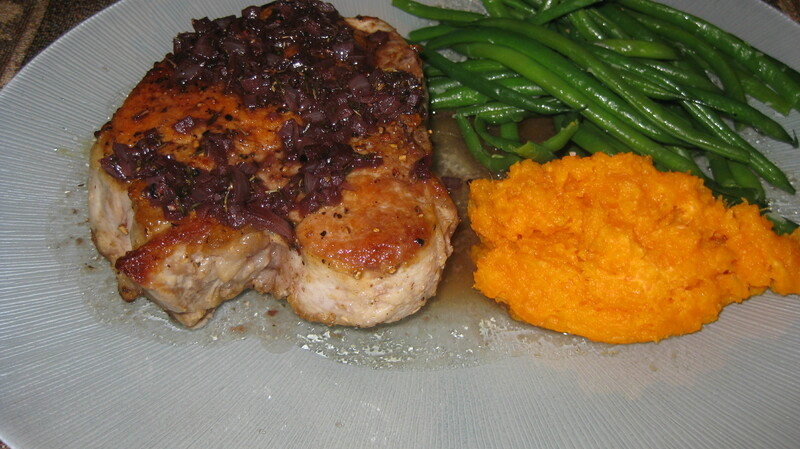 Here’s a quick and easy method to pan roast pork chops and then make a delicious pan sauce to serve over the chops. Serve with our Mashed Sweet Potatoes with Goat Cheese!